One fun thing about garden-grown spinach is that you get the blossom pods (I have no idea what they're actually called) if your plants start to go to seed. Steamed, these have a great texture, with each of the little would-be blossoms popping between your teeth. 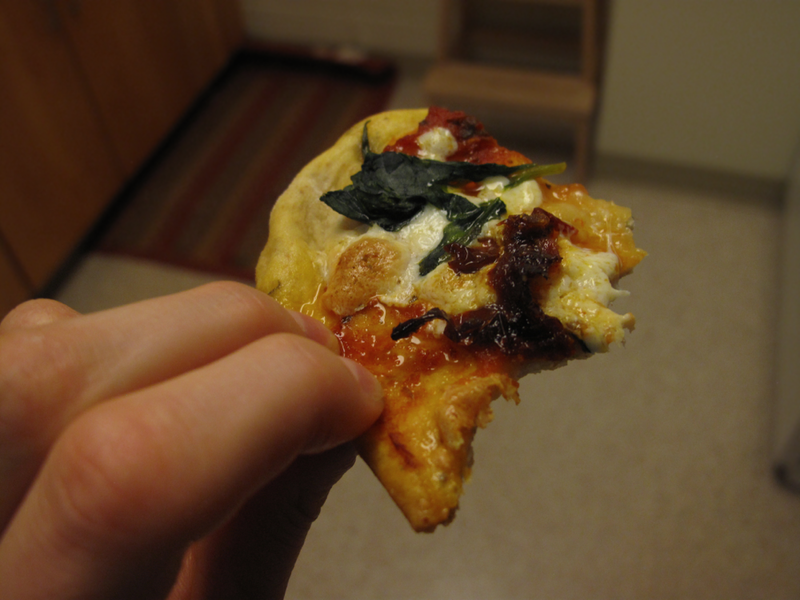 Today I made a pizza (one of our favorites) with garden spinach and my other two favorite toppings: sun-dried tomatoes (the kind stored in oil), and artichoke hearts. My thin pizza crust is pretty simple, as it's purpose is to hold all the good stuff on top, but if I'm feeling fancy, I'll throw in a few spices. There was once much household angst about thin vs. thick crust, as NWC favored the former and I the latter, but I've slowly converted to thin crust because then the toppings drive the show. Don't get me wrong, I love a good Chicago deep dish, but thin crust is much easier to manage at home. Mix dries first, and then add water until just combined—the dough should be tacky or very slightly sticky. For best results, let dough sit for a few minutes before rolling out. Flour you surface generously and roll the dough out very flat, turning regularly to maintain an even thickness. (I love my dowel rolling pin for this.) Drizzle oil generously in a jellyroll pan, and stretch the crust into place; bake at 375F for under 10 minutes—enough to solidify the form, but not enough to start browning. Steam and drain spinach while crust is cooking, and grate cheese. Spread sauce on crust, sprinkle cheese, and arrange toppings on top. Bake at 400F until cheese has melted and is beginning to brown. Slice and serve!